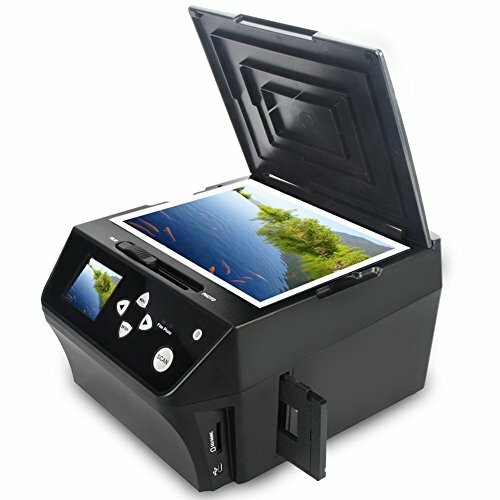 The Fast & Easy way to scan your photos, slides & negatives to High Quality Digital Photos ,no computer or drivers required ....it's portable enough to use anywhere! Do you have a stack of family photo albums or a box of old slides and negatives Convert your photos to digital format to preserve them and pass them on to your friends and family! With the DIGITNOW! QuickConvert, it's easier than ever to turn your photos into digital pictures. The QuickConvert doesn't require a computer, which means that it's quick to set up, easy to use, and extremely portable. You can have the converter set up and ready to start digitizing your photos, slides, and negatives in just minutes. The QuickConvert's 2.4" screen allows you to preview each photo before you convert it. Conversion is extremely fast: just load your photo, slide, or negative, and hit the conversion buttons. In just 2-3 seconds, your photo will be saved in digital format onto the included memory card! The converter works with 3x5, 4x6, and 5x7 photos, as well as 35mm slides and negatives. The converter digitizes your photos, slides, and negatives at a high-quality resolution of 20 megapixels (interpolated). The DIGITNOW!QuickConvert comes with an 8 GB memory card (which can hold over 2,000 photos). PhotoPad Pro image editing software is also included, which can be used to edit, retouch, resize, and crop your photos, as well as to make beautiful collages of your photos.